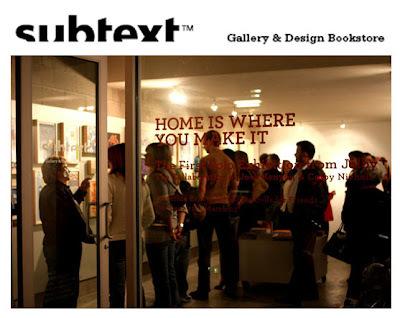 Subtext is one of my fave local galleries, and you know, cool galleries here in San Diego are rare. This ain't yo mama's standard art gallery. They have a constant flow of cool exhibitions showcasing urban contemporary, pop surrealist and lowbrow artists showing off their skills in art media ranging from paintings, graphic design, architecture, and photography. This gallery and bookstore (yes! you can fulfill two basic needs...eye-candy and retail therapy) is located at 2479 Kettner Blvd.,92101. 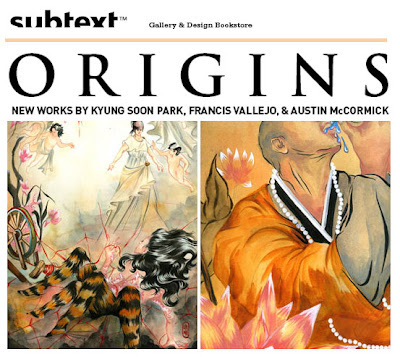 Their upcoming show, Origins, which begins with an open reception on June 5 at 6-10p.m., will feature 3 artists, Kyung Soon Park, Francis Vallejo and Austin McCormick.